The end of March and early April are going to bring some big spring astrology energies. 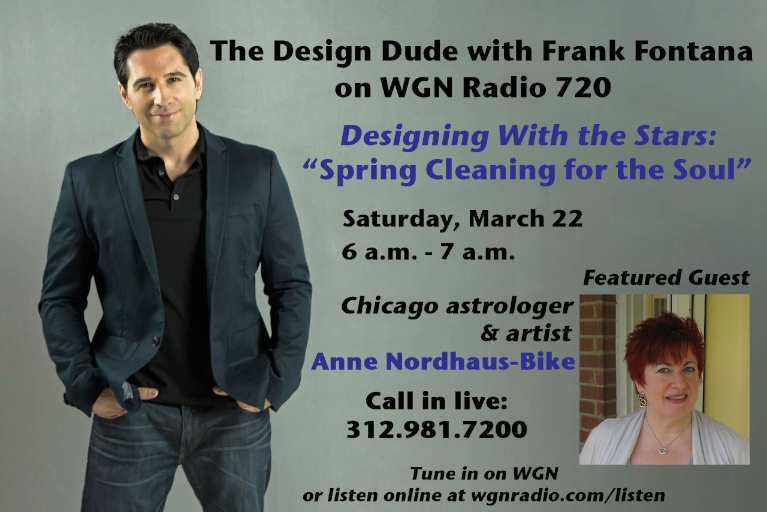 You can get all the details—and special tips to prepare for all the opportunities coming your way—this Sunday, March 1, when Anne returns to WGN Radio host Frank Fontana’s popular afternoon program. The show airs on WGN Radio AM 720, and you can listen on radio in the Chicago area or listen anywhere in the world online at http://wgnradio.com/on-air/. Take Note: Special Time for This Special Show! On March 1, Fontana’s show will start one hour earlier than usual, at 12:00 noon Chicago time. Anne will be joining Frank at the show’s start, so be sure to tune in on time to hear her special, uplifting segment and get a jump on this year’s powerful spring astrology. Listen live on your radio at AM 720 if you’re in the Chicago metro area, or listen online on any computer or mobile device, from anywhere in the world, at http://wgnradio.com/on-air/. Listeners will be welcome to call in or text their questions and comments at (312) 981-7200. Be sure to tune in early and call as soon as possible, as the phone lines fill up quickly whenever Anne is on Frank’s show. Enjoyed the show. Anne you have a sharp wit. You come up with quick answers.